Enthusiastic online community, cluster of new cookbooks can help Instant Pot newbies navigate the learning curve. Welcome to the Instant Pot support group! We’ve been waiting for you. So a sale came around and you finally snagged the multipurpose electric cooker everyone’s using. We promise you won’t regret it. You will make luscious pulled pork and savory stocks and yogurt and sushi rice and even cheesecake. But first you have to go through the emotional roller coaster of a new Instant Pot owner, where joy gives way to bewilderment in pathways as predictable as the stages of grief. Let’s start at the beginning: It’s not you, it’s them. If you find the pot’s setup confusing, it’s likely because the manual is unhelpful. How unhelpful? On the pot’s official Facebook community group, I asked fellow members one day if anyone found the manual helpful. The answers were immediate: “no ha ha.” “nope.” “no.” “no.” “nope.” An hour and 30 more responses later, the moderator shut the thread down for negativity. On the bright side, other resources are free and abundant. The Facebook group itself is supremely helpful, with nearly 700,000 members sharing recipes, tips, timely answers to questions like “How do I convert this recipe from a slow cooker to a pressure cooker?” and uplifting stories of Instant Pots helping feed hurricane refugees or families in hotel rooms or groups in RV campgrounds. Cookbook authors are also rushing into the recipe void, with established heavy hitters now catching up to the first wave of e-books and bloggers. Michelle Tam and Henry Fong of Nom Nom Paleo make fine use of the pot in their new book, “Ready Or Not!” (Andrews McMeel, $35), which isn’t solely devoted to the Pot but calls it a home-cook game changer and uses it in various recipes. They also provide helpful links on their website. Always-reliable cookbook author Melissa Clark takes on the challenge with the new “Dinner in an Instant” (Clarkson Potter, $22), including 75 recipes from homemade ricotta cheese to Indian butter shrimp. And “The Essential Instant Pot Cookbook” by Coco Morante (Ten Speed Press, $19.95) offers a concise and quite useful guide that will get beginners well on their way, along with a solid array of fundamental recipes. It’s Not Really Instant: Yes, some of your dinners can be made in a fraction of the time they’d take on the stovetop. That’s great. But it takes an estimated 5 to 30 minutes for the pot to come up to pressure in the first place, depending on what you’re cooking and the quantities. And if you choose to let the pressure release naturally from the pot after cooking (“great for keeping your kitchen nice and clean,” the Instant Pot website states a little ominously) rather than releasing it manually, you might add another 10 minutes or more to the clock. One typical online recipe for “3-Minute Applesauce,” for instance, keeps repeating how it is Three. Minute. Applesauce. (“Seriously.”) Once you read the recipe, you’ll realize that three minutes doesn’t include the pressurizing time (I’m guessing 10 minutes here) or the 15 minutes it says to allow for depressurizing. Personally, I think 28-minute applesauce is still convenient. One of my friends even broke a yearslong Amazon boycott to buy the Instant Pot on sale after seeing how easily it made apple and pear sauce. But “28 minutes” clearly doesn’t have the same ring. 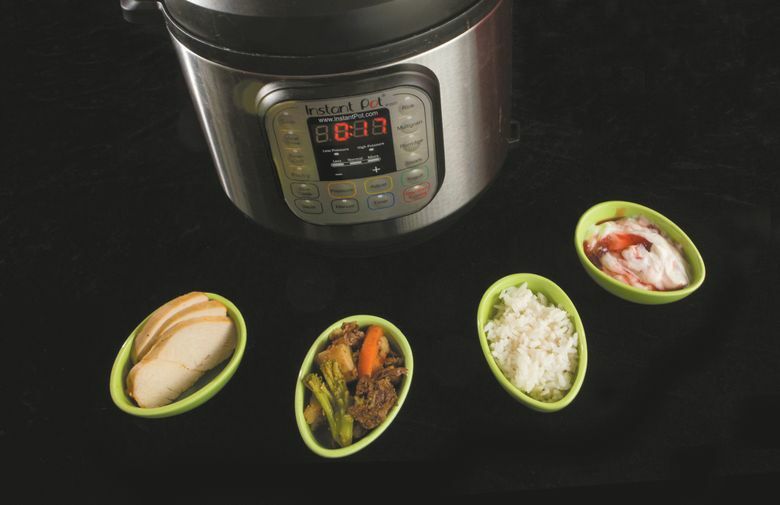 Pick Your Battles: The Instant Pot is like the Ginsu knife of the kitchen cabinet. It sautés! It slow cooks! It pressure-cooks! It’s a remarkable multiuse tool. The pot cooks rice and makes yogurt well enough to replace a rice cooker and yogurt maker (in fact, as I’ve written before, a sure sign that a family has purchased an Instant Pot is when they give away those appliances) — but just because it can do all these things doesn’t make it ideal for every one. As Clark summarized in her book, “It can’t cook a whole chicken very well, and it doesn’t do crisp or crunchy. So don’t ask it to and you won’t be disappointed.” Tam avoids cooking anything in a pressure cooker that can be quickly prepared using a conventional method like sautéing or stir-frying. “Otherwise, you’ll risk overcooking your food in the pressure cooker, and in the end, you won’t save much time,” she wrote. What It Does Well It Does Really Really Well: The pot does explode (again, not literally!) some long-established kitchen norms. Want to make chili from dried beans? Forget about needing an afternoon to simmer away; it’ll be done an hour or two after you start. Use your Instant Pot for beef stock and you’ll wind up with the most collagen-rich broth imaginable and desiccated, chalky bone remnants that look like they belong in a science lab. Other winners that delight new pot owners include hard-boiled eggs (they don’t cook any faster, but they’re reliably easy to peel), hummus made from dried chickpeas and creamy cheesecakes. The Sealing Ring Gets Smelly: The silicone sealing ring pressed into the Pot’s lid picks up odors from food. Some cooks buy an extra ring or two and reserve one for savory dishes and one for sweet, much like they do for cutting boards. Morante recommends replacing the rings every 6 to 18 months, depending how much you use them. You Will Learn New Vocabulary Words: QR (quick release)? PIP (pot in pot)? It looks like gibberish at first, but it doesn’t take long to pick it all up. In the Facebook group, members pre-emptively post links to basic questions and best recipes as they prepare for the wave of new members who come with questions after every online sale. There’s just one group that doesn’t join up with predictable troubleshooting needs: the ones who took advantage of the sales to buy a second or third model.